In Genesee County, nearly 10,000 YOUNG PEOPLE ages 16 to 24 are not engaged in work or education. In the United States, there are a reported 5.8 million young people who are disconnected from education and from the job market. This population of Opportunity Youth struggles to stay in school and enter the workforce, often facing challenges of poverty and homelessness. 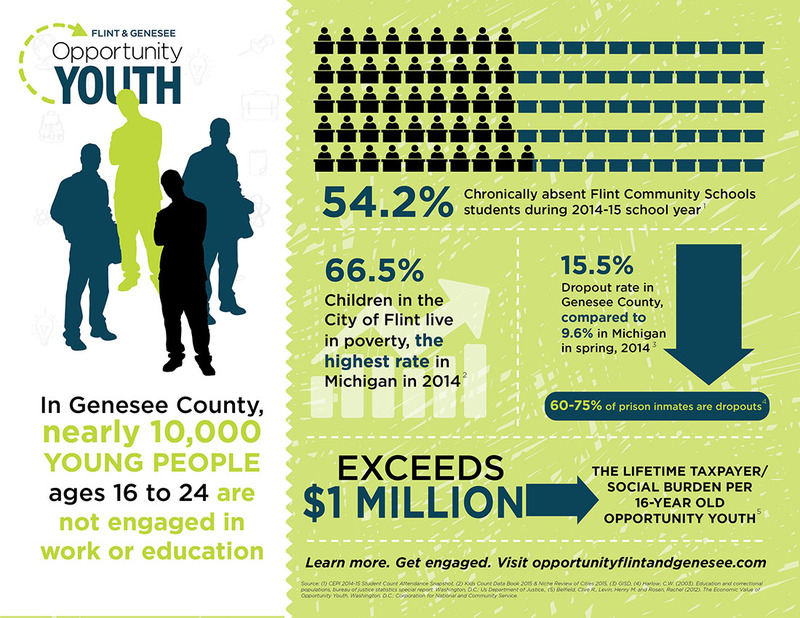 Opportunity Youth in Flint and Genesee County are cut off from the people, institutions, and experiences that help them develop the knowledge, skills, maturity, and sense of purpose required to live rewarding lives as adults. 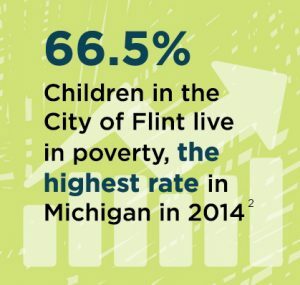 By collectively facing these challenges, Flint and Genesee County leaders and citizens can help change the life course of thousands of young people and strengthen the city’s and county’s economic and social prospects. Learn more about this population in Flint & Genesee County through this report compiled by the University of Michigan-Flint. A 2012 study by the Annie E. Casey Foundation found that “the data show that the populations struggling the most the most to enter the workforce and stay in school today are youth who are less educated, come from low-income families and belong to a racial or ethnic minority. African Americans have the highest rate of youth disconnection, at 22.5 percent –more than one in four young people. Latinos have the second-highest national youth disconnection rate, at 18.5 percent. The disconnection rate for White youth stands at 11.7 percent. The dearth of opportunities for these youth is costly for them and for taxpayers. The longer these youth remain disconnected from school and work, the more likely it becomes that they will remain unemployed and live in poverty as adults. The lack of opportunities for these youth also imposes a significant economic burden on taxpayers; by one estimate, the per person cost of these disconnected youth is $13,900 per year in lost tax revenue, additional health care spending, expenditures for the criminal justice system and corrections, and welfare and social service payments. In 2011, youth disconnection cost taxpayers $93.7 billion in government support and lost tax revenue. Young men are slightly more likely to be disconnected that young women, a reversal of the situation found in decades past. The situation varies by race and ethnicity, however, The gender gap is largest among Africa Americans: nationally, 26 percent of African American male youth are disconnected, compared to 19 percent of their female counterparts. Compared to their peers in the general population, disconnected youth tend to have fewer years of education and are more likely to live apart from their parents and (if they are married to a disconnected spouse or are not married) to have children. Disconnected youth are also twice as likely to be poor than their connected peers. Parents of disconnected youth are more likely than their counterparts to be unemployed and to have lower educational attainment. About 3 out of 10 disconnected youth ages 19 through 24 lacks a high school diploma or its equivalent. Among disconnected youth living in single-parent households, over 40 percent have parents who are not employed. Living in poverty has negative effects on children’s life outcomes, including disconnection. Poor children tend to score lower on standardized test of IQ, verbal ability, and achievement, and are less likely to advance in grade and complete high school. Poor teen adolescent girls are more likely to become teenage mothers than their non-poor counterparts, contributing to a cycle of poverty from one generation to the next. The U.S. Department of Education states that poverty among adolescents in negatively related to high school graduation, college attendance, and years of schooling. In 2009, the high school dropout rate for students living in low-income families (7.4%) was more than double that of middle income students (3.4%) and five times greater than their peers from high-income families (1.4%). Poverty may be both a cause and consequence of youth disconnectedness. Growing up poor may contribute to the likelihood that a child will be disconnected in making the transition from adolescence to adulthood. In turn, being disconnected may contribute to youth being poor, especially among youth who are no longer living at home with parents or other family members to contribute to their support. Disconnected youth may also lack strong social networks that provide assistance in the form of employment connections and other supports such as housing and financial assistance. Long-term disconnected youth – who are not working or in school for at least 26 weeks in three or more years , tend to have family background factors, including family poverty, family welfare receipt, and how parent education. On a given night in January, 2014, there were approximately 194,302 homeless children and youth ages 24 and younger, representing one-third of the individuals who were homeless that night. Between the 2010-11 and 2013-14 school years, the number of homeless students, a high percentage of which are at-risk for disconnection, reported by Local Education Agencies (LEA) under the McKinney-Vento Homeless Assistance Act increased 28%, from 1,065,794 to 1,360,747 students. These young people experience higher rates of acute and chronic physical illness and higher rates of mental illness and substance abuse than their peers who have stable housing. The high mobility associated with homelessness also disrupts the education of these youth, placing them at greater risk of falling behind and dropping out of school. Whether a young person lives in a wealthy or poor community is highly predictive of his or her likelihood of disconnection. Youth who are or have ever been in foster care are at high risk for negative educational and employment outcome. Youth who age-out of the child welfare system at age 18 are at particularly high risk for homelessness, with an estimated 11 to 37% experiencing homelessness, and 20 to 50 percent living in precarious housing situations. Youth in foster care are less likely to graduate from high school than their peers, and those who do complete high school are less likely to enroll in post-secondary education than their peers. As these youth transition out of foster care and enter adulthood, they often face long odds in the labor market. They tend to have greater difficulty finding employment and when they are employed, tend to have lower earnings that youth in the general population. “Youth and Work: Restoring Teen and Young Adult Connections to Opportunity” (PDF). The Annie E. Casey Foundation (2014). One in Seven: Ranking Youth Disconnection in the 25 largest Metro Areas. (2012). Measure of America. Measure of America. org. Besharov, D.J., & Gardiner, K.N. (1998) Preventing Youthful Disconnectedness. Children and Youth Services Review. Belfield, C.R. Levin, H.M., and Rosen, R. (2012). The Economic Value of Opportunity Youth. Washington, DC. Civic Enterprises. Reference 2  Ibid. Ibid. Ibid. Chris Chapman et al., Trends in High School Dropout and Completion Rates in the United States: 1972-2009, Department of Education, National Center for Education Statistics, 2011. Reference 2  Ibid. Brett V. Brown and Carol Emig, “Prevalence, Patterns, and Outcomes,” in America’s Disconnected Youth: Toward a Preventative Strategy. (1999). Washington, DC: AEI Press. Henry, M., Cortes, A., Shivij, A., and Buck, K. (2014) Annual Homeless Assessment Report to Congress. Washington, DC: U.S. Department of Housing and Urban Development. www.hudexchange.info/resources/documents/2014-AHAR-Part1.pdf  Education for Homeless Children and Youth Consolidated State Performance Report Data: School Years 2010-11 and 2013-14. Washington, DC: U.S. Department of Education. http://eddateexpress.ed.gov/. Moore, J. (Undated). Unaccompanied and Homeless Youth: Review of Literature (1995-2005). Washington, DC: National Center for Homeless Education. http://center.serve.org/nche/downloads/ny/lit/review/.pdf  Ibid. Dion, R., Dworsky, A., Kauff, J., & Kleinman, R. (2014). Housing for youth aging out of foster care. Prepared for U.S. Department of Housing and Urban Development, Office of Policy and Research. Washington, DC. http://www.huduser.org/portal/publications/pdf/youth/bsg/main/report.pdf. Frerer, K. Sosenko, L.D., and Henke, R.R. (2013). At Greater Risk: California Foster Youth and the Path from High School to College. San Francisco, CA: Stuart Foundation. Macomber, J. et al. (2008). Coming of Age Employment Outcomes for Youth Who Age Out of Foster Care Through Their Middle Twenties. Washington, DC: Urban Institute.